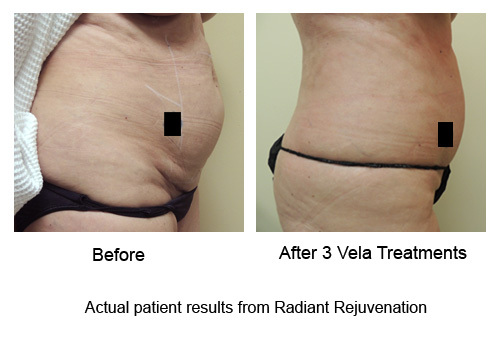 Radiant Rejuvenation & Cosmetic Surgery is the first clinic in Washington State and one of the first in the United States to offer VelaShape III! This new product from Syneron offers a non-invasive solution for cellulite and circumference reduction treatment. VelaShape III uses the combined technology of bipolar RF (radio frequency) energy, controlled IR (infrared) light, and pulsed vacuum suction to reduce the contour of problematic body areas and improve skin laxity and the appearance of cellulite. During clinical trials of the VelaShape III for FDA approval, the average abdominal circumference reduction was a 2.6 cm decrease 10 weeks after one single VelaShape III treatment. VelaShape III is safe for all skin types and colors, with no reported negative health effects. It is comfortable, too! Most patients describe it as feeling like a warm deep tissue massage. Call us today at 425.712.7546 for a free initial consultation to see if VelaShape III is right for you! Click here for more VelaShape III images.